If you have employees, follow the instructions below to add them in. Fill in your employee info. We'll send them a text letting them know their company set them up with an account and provide their log in email and info. Once they download the Housecall Pro App, they'll click LOG IN to use their email and password combination to get into the account. If you save and the email says it isn't available to use, click on the chat bubble so our tech support team can resolve it for you! Office Staff - Office workers/schedulers will be able to access the web portal as well as the Housecall Pro app. View a breakdown of Office Staff permissions here. Field Tech - Field techs are only able to access the mobile app, unless the ADMIN toggle is toggled on. 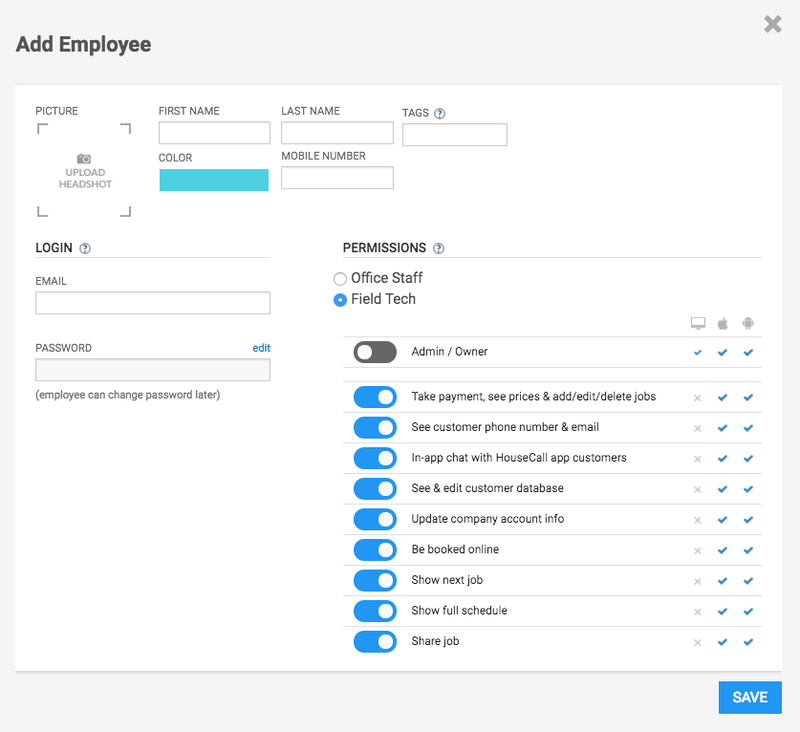 View a breakdown of Field Tech permissions here. Make sure to hit save to add your employee. Repeat these steps for as many employees you have. You can always come back and edit the permissions and info at any time.